Archive for the ‘Wedding Invitations’ Category. If you are ringing in the New Year with a sparkly new engagement ring on your finger, congratulations! A holiday proposal is so romantic. We hope you are enjoying showing off your new ring…and your beautiful new commitment to one another. Before you know it, your days and weeks will be filled with planning. 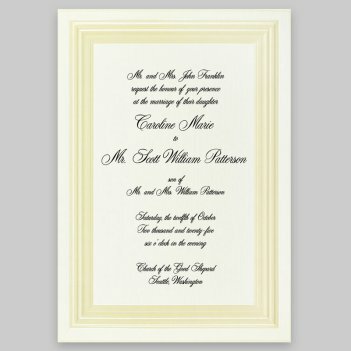 And of course, you’ll be looking for wedding invitations. Which is wonderful, because now your favorite personalized stationery, napkin and gift company offers wedding and special event invitations. You can immediately preview your creations, so you can play to your heart’s content with the 20 lettering style choices, 11 raised-ink color choices, paper color options, and solid envelope lining choices to discover the combination you prefer. Don’t wait weeks and weeks. 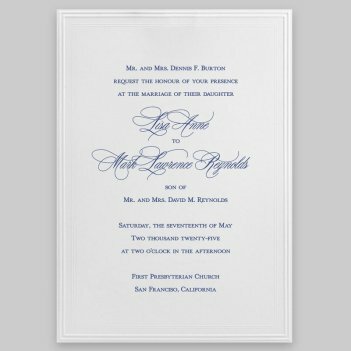 Tradition Wedding Invitation ships in 24 hours. You can use one lettering style, or combine two. There are no hard and fast rules…it’s really up to what pleases your eye. But here are some rules of thumb. Opposites attract: Pairing something round and flowy for the names with something simple and easy to read always works. Easy does it: Avoid using a hard-to-read font for large blocks of text. That can be frustrating and …oops! Send Uncle Harvey and Aunt Noreen to the wrong address. Amour Wedding Invitation ships free. If you know how you want to word your invitation, wonderful! You have up to 15 lines to express your joy and welcome your guests. Not sure what to say? Never fear…sample invitation text is available. Click on the ‘Insert sample text’ link and… voila… we’ll automatically supply it. 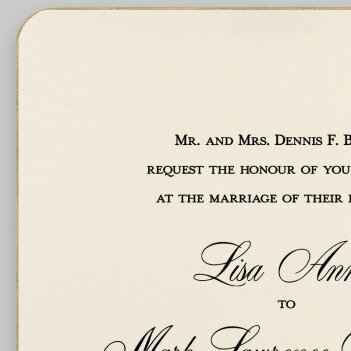 Get started now in creating the wedding invitations of your dreams. and is dedicated to producing your order in 24 to 48 hours. All materials Copyright 2015 giftsin24.com. All rights reserved.